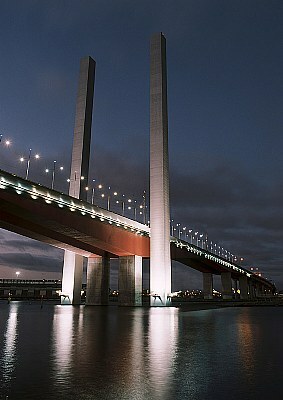 About One of the main bridges into Melbourne. You've managed the light really well. Great shot Jason. Very sharp, crisp, clean image with balanced levels, worthy of it's award, congrats. Wow, fantastic shot on this awesome looking bridge !! Excellent dof and outstanding details and sharpness. Take care buddy and keep them coming. it sells as a poster !! perfect sharpness and some great tones! hope i can travel around this country one day at my own pace like you, but thats a bit of a pipe dream at the moment but i'll keep aiming.. Fantastic, Jason. Perfect view point and exposure. Congrats on your BIP. Cheers, Ann. Wow. Fantastic! Congrats in your BIP. Well deserved. I like the fact that you have given space at the top of the picture. great lighting, tones and detail. Qué fabulosa captura.. la lunminosidad y los reflejos geniales!! Felicitaciones por la foto y por el merecido premio! Hey Jase - great job ! How come this didnt make it in the calendar? clear and great just a BIP! Very nicely captured Jase. The smooth surrounds of colour compared to the sharp edges of the structure make for a great image. An image to be proud of. Fantastic job! Looks just as good with the top cropped giving a quite different view point.